One of Detroit's hardest working and respected emcees, Invincible, has teamed up with one of Hip- Hop's most versatile and respected producers, Waajeed, to release "Detroit Summer," a two-song 7" single. 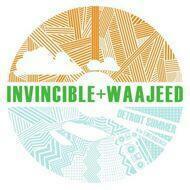 "Detroit Summer" is the most profound collaboration yet between the two artists and is sure to whet the appetite of listeners awaiting Invincible and Waajeed's full- length due to drop in 2011. The cut is a sequel to the earlier collaboration, "Detroit Winter," off the Platinum Pied Pipers Triple P album. Detroit based Hip-Hop artist Invincible began penning lyrics at the age of 9, shortly after moving to the Midwest from the Middle East.She started her own media company EMERGENCE and released her critically acclaimed album Shapeshifters in 2008. Her lyrics are deeply rooted in social justice work, reflected in a writing process that often involved community interviews and feedback. Waajeed started out Djing for basement parties, school events, and neighborhood rap groups in his hometown Detroit. He connected early on with Slum Village and skipped out of art college to join them on tour. With encouragement from the legendary J Dilla, his initial tinkering with an MPC 200 morphed into a focused commitment to learn the craft of production.